How it must churn in the guts for rugby loyalists to see the ever-increasing presence of the AFL footprint on their hallowed harbour side grounds. It shouldn’t really matter if we’re wanting to promote sport and encourage female sport’s participation this weekend … but it stings. Nevertheless, it was indeed a treat to attend the GWS v Carlton AFLW match at Drummoyne where the AFL and the local organisers must have seen a screening of The Greatest Showman. They went all out to impress and leave indelible memories for those that attended. And throw in the weather gods! The oval is situated on the incline down into the harbour where the park trees make way for an immense lawn embankment on the outer side of the oval. A quaint old mid twentieth century grandstand at one end is balanced with the state of the art equivalent at the opposite end. Even the five giant light towers blend into to this charming harbour-side ambiance. Outside the gates were a myriad of activity areas for those families with kids wanting to get involved with some ‘physicality!’ Handball, kicking and of course, merchandise. Inside and outside parading around was a three-piece brass combo blasting out jazzy tunes. Parents smiled as their little ones were targeted for a little individual solo treatment raising eyebrows and giggles. Girls on stilts paraded around in outfits straight from a Moulin Rouge cabaret show laughing and winking as they stilted past. A not too overbearing PA system interposed the latest pop songs with ground announcements and Giants info. 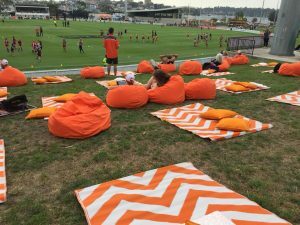 Over in the outer if you were lucky enough to be a GWS AFLW member, you were able to take your pick of bean bag or picnic rug for the match, all with good views. Make your way to this area via a series of food vans to tempt any culinary wish. A good-sized scoreboard and screen kept us up to date on GWS merchandise, players and sponsors products. So, the stage was set. Bring on the footy! The Carlton girls entered first through a banner exclaiming they were playing for ‘keeps’ in reference to their coach on sick leave back in Mexico. The Giants crashed their banner via a family guard of honour and the now familiar tall black flame stacks. A strong breeze favoured the city end and a light drizzle began the game. What was to unfold was extraordinary. A near packed outer was routed as the heavens opened with torrential rain, vertical and horizontal lighting and ear-splitting thunder crashes. Snug, warm and dry in the old stand, we watched amazed as this exposition of nature played out before us. The players and officials were ordered from the field and the two thousand or so spectators in the outer squeezed into sheltered areas or sadly went home. The bean bags turned soggy! The recommenced game then saw the usual standard of play consistent with wet conditions – scrappy and difficult to use the ball cleanly. Despite these trying conditions, there were plenty of first rate skills to be seen, most notably some terrific marks. Carlton’s win was a dour affair that finished with a 21-point win. The Giants seemed to be in the match until the last quarter despite a seemingly overwhelming finishing difference of 15 scoring shots to 4. It was a good win but not a joyous one, the mood tempering post-match as the club had to contend with ‘Brownlow’ favourite Bri Davey on crutches. The blue girls had certainly paid the price for the four points. Even with Thor, the God of Thunder, delaying the match in the second quarter, the celebrations continued. As the final siren sounded, the remaining crowd was again mesmerized by a 15min. fireworks show. One couldn’t help feeling that there were some leftovers from New Year’s Eve. And this was when the Giants lost? What would they do if they win!! Yet the locals need to learn a few basics if they are going to adopt our great game into their football lives – ensure the ground sells pies and sauce and don’t forget the hot jam donuts as we all leave the game! As a Victorian, I was mightily impressed with the whole show but felt for those who believe the ‘greatest game of all’ is being threatened. 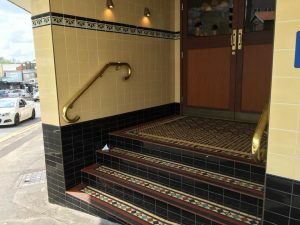 Yet this seemed to balance out when we visited the Oxford Hotel in downtown Drummoyne – it’s always a treat to visit these classic ceramic tiled buildings from last century. However, there we were to ready to savour a real NSW brewery experience only to find that there was no Toohey’s Old on tap – or even in a stubby! We did have our choice of Victorian and craft beers to select from with a lonely old Toohey’s New at the end of the row! Time’s are indeed a changin’ in Sydney. With minor tweaks, Drummoyne will be a favourite AFL ground for footy and for the fan experience. Thank you Dave. Before reading I wondered if you were drenched, but the old grand stand must have been an amazing place to watch the afternoon unfold. What havoc the weather played, and then injuries to three players on top of it. Very disappointed about Bri and the others. Thanks for the photos. Loved the orange-ness and the tiles. Bloody Sydney weather, eh? Can’t trust it. Glad you stayed dry! The other side of the ground was terrible. And apologies for the lack of Old on tap. To be honest, I find it hard to go into pubs in inner Sydney these and find something on tap that I recognise. I’m getting old. Knowing a thing or two about Dave’s penchant for a cold quiet ale, I would have ben most surprised if he hadn’t been able to find suitable substitutes for a Toohey’s Old. A lack of choice has never stopped you savouring a cold froffy in the past, Dave. See you in Adelaide in a couple of weeks Dave for what may be a GF defining match for the Blues.